Indium Corporation has released a new solder research kit designed for soldering to gold plating using indium-based alloys. Gold is often used in electronics assembly because it resists oxidation and solders readily. This makes gold ideal for plating contact surfaces for switches and connectors. The more commonly used tin-based solder alloys rapidly scavenge or dissolve the gold during the reflow process, leading to the destruction of gold conduction patterns. Tin-based alloys also result in crack-inducing platelets within the solidified solder joint. Indium-based alloys, especially those in the indium-lead (InPb) family, cause appreciably less gold scavenging damage than tin-lead (SnPb) solders. The Soldering to Gold Research Kit allows you to choose three different alloys from seven that are offered for the kit. The alloys come in the form of 0.76mm (0.030”) solid-core wire and represent melting temperatures ranging from 143-310°C. The kit also offers two compatible fluxes - TACFlux® 007 and TACFlux® 012. Order your research kit at www.buy.solder.com. If you want more information on how to solder to gold, visit www.indium.com/soldering-to-gold. 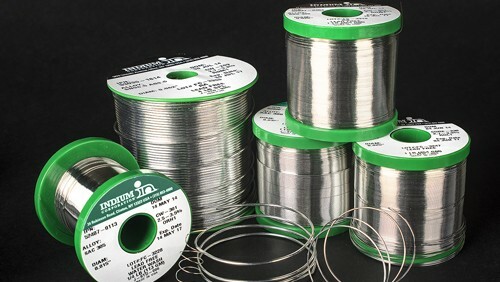 For assistance on selecting the best alloys for your application, visit Indium Corporation’s Solder Alloy Selector Guide at www.indium.com/solder-alloy-guide or contact our technical support team at askus@indium.com.